Abu Dhabi: More than 1 million Chinese tourists are expected to visit the UAE this year, a top Chinese diplomat has said. “In 2017, the number of Chinese tourist arrivals in the UAE exceeded one million for the first time and about 3.5 million Chinese tourists transited through the UAE. The UAE is the first Middle East country whose nationals with ordinary passports enjoy visa-free entry to China,” said Ni Jian, the Chinese Ambassador to the UAE. “Since two countries share free visa policy, [Chinese visitors to the UAE get visa on arrival] people-to-people relations and cultural exchanges have considerably improved,” he said in an interview with Gulf News on the occasion of the Chinese National Day celebrated on Monday. 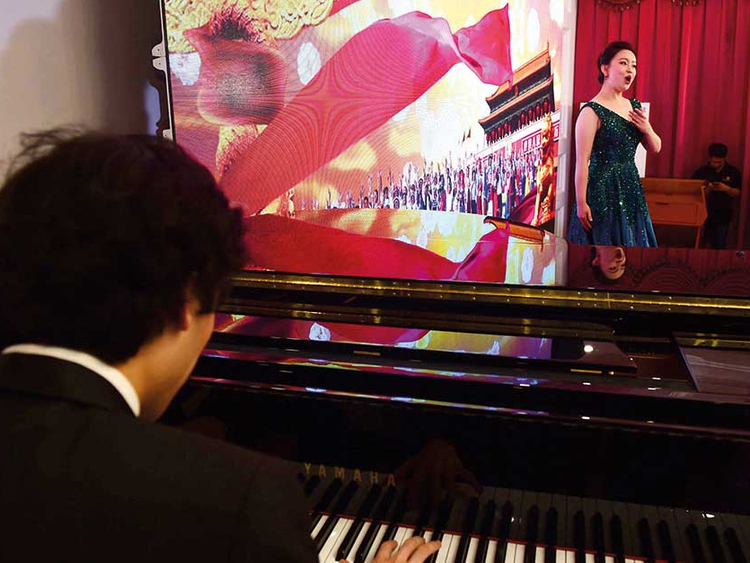 The UAE hosts the largest Chinese diaspora in the Middle East, Jian said. Although the exact number of the Chinese population was not available, it would be somewhere between 200,000 and 300,000, he said. Most of them are living in Dubai and there is a small community of around 2,000 in Abu Dhabi, the envoy said. The enthusiasm for learning Chinese keeps increasing in the UAE, thanks to the growing relations between both peoples and governments, he said. The initiative proposed by His Highness Shaikh Mohammed Bin Zayed Al Nahyan, Crown Prince of Abu Dhabi and Deputy Supreme Commander of the UAE Armed Forces, of teaching Chinese in 100 UAE schools is well under way, Jian said. The first batch of 20 Chinese teachers have already started teaching Chinese in 11 schools, he said. More than 100 young Emirati talents have visited China as part of six China tours organised by the UAE Youth Ambassadors Programme. “This year is a special year for China — UAE ties as the bilateral relations were elevated to the comprehensive strategic partnership during the successful UAE visit of the Chinese President Xi Jinping in July,” the envoy said. The ambassador hosted a reception at his residence to celebrate the 69th anniversary of the founding of the People’s Republic of China on Monday evening. 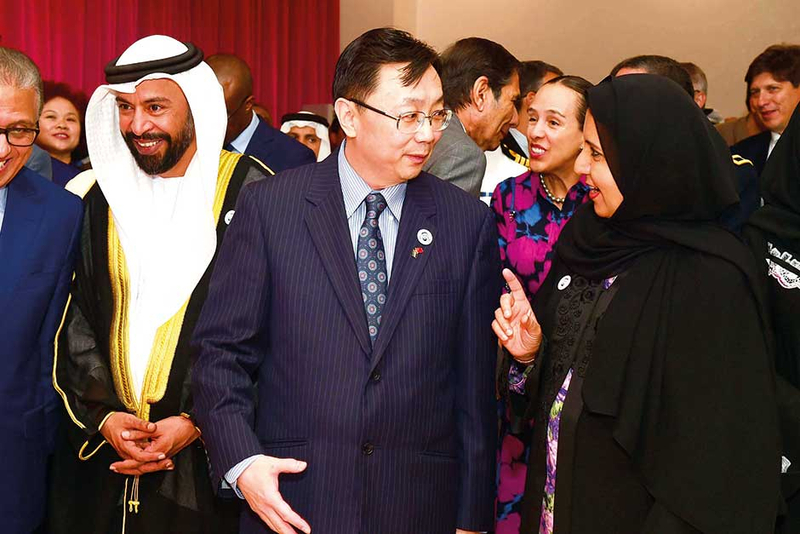 Dr Maitha Salem Al Shamsi, Minister of State, was the chief guest at the event attended by senior Emirati officials, foreign diplomats and Chinese community members. Addressing the guests, Jian said the National Day this year fell on an auspicious day. “It is coincidence that today is the eighth day of the eighth month in the Chinese Lunar calendar. In Chinese culture, eight is a lucky number, which is believed to promise good fortune and bright prospects,” he said. The year 2018 is extraordinary for China, the ambassador said. “It marks the 40th Anniversary of China’s Reform and Opening-up Policy. Over the past 40 years, we remain true to our original aspiration to work tirelessly and strive with one heart to carry forward the reform. Till now 700 million people have been lifted out of poverty, China has become the second largest economy in the world, and its international influence has been improved significantly,” Jian said. China has become the largest trading partner of the UAE, a top Chinese diplomat said. The UAE has been the second largest trading partner and the largest export market of China in West Asia and North Africa for many years, said Ni Jian, the Chinese Ambassador to the UAE. “In 2017, our bilateral trade volume reached $41 billion (Dh150.47 billion). With a total investment of over $2.1 billion, the UAE has the largest number of investment projects in China among Arab countries,” he said. The year 2018 also celebrates the fifth anniversary of China’s Belt and Road Initiative and cooperation with the UAE under this framework has witnessed concrete steps, Jian said. Major projects of joint construction and operation such as Khalifa Port, China-UAE Capacity Cooperation Demonstration Park are making smooth progress, he said. Chinese enterprises are acquiring franchise rights in Abu Dhabi’s onshore and offshore oil blocks. China-UAE Investment Fund is well managed. The 700MW Concentrated Solar Power (CSP) plant and the Hassyan Clean Coal Power Plant in Dubai, jointly constructed by the two sides, are running smoothly, the envoy said. China’s volume of trade in goods with countries along the Belt and Road totalled about $5 trillion, with over $60 billion US foreign direct investment and more than 200,000 new jobs created for the local people. Last year, with a growth rate of 6.9 per cent, China’s GDP was more than $12 trillion, contributing more than 30 per cent to world economic growth. For the first half of this year, China’s GDP grew by 6.8 per cent, compared to the same period last year, the ambassador said.